This is Cheek Gradation in 04 (Chocolate Stripes). 2. or as recommended on the website, use the 2 darker colours as the blusher and the 2 lighter colours as the highlighter. I tried both ways. Method 2 did not work for me cos the browns are too dark to be used as blushers. Contouring maybe but it's very shimmery. The effect of method 1 was rather unexpected. It gave my cheeks a nice glow with pearl sheen to it. Although there were browns, it wasn't prominent. I supposed you have to swipe downwards if you want more pinks on it. And the best part? 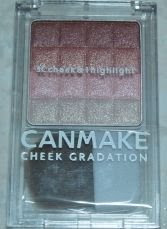 This cheek gradation can also be used as eyeshadow. So if you find this doesn't work well on your cheeks, at least you can use it on your eyes. The browns look lovely on the eyes, and the light champagne gold colour can be used for the inner corners of your eyes to brighten up. You can then use the pink stripe separately as blusher. I would totally bring this out if I don't want to bring too much things with me. It's so useful.